My favourite development of the last month has been Archie's increasing love of cuddles. He grabs you tightly round the neck and rests his little blond head on your shoulders, saying "ahhhh", and usually making you forget the fact that he has just put an empty washing machine on for an extra long spin or smashed the last remaining easter egg by throwing it off the table. He is affectionate with most people and he cuddles friends and family whenever he sees a chance. Archie is also a mischievious monkey, and seems to be drawn to toilets. If he isn't trying to climb in, then he is flushing any thing he can find down it, and we have to rescue shower gels, socks and toy cars frequently. He climbs on everything and anything, and loves to climb in and out of his highchair, over the dining table and into the washing machine. He is also rather fond of the tumble dryer and is only happy once he has turned it on. Archie is active, he rarely stops and he never sits still. He wants to walk with the other children and doesn't understand when I pick him up after he keeps going down garden paths to knock on people's doors! In his mind he is as big and able as his brother and he doesn't want to be held back. At 15 months Archie still has an insatiable appetite for pasta and can easily demolish a portion bigger than mine. He has started feeding himself with a spoon but it doesn't last long before he resorts back to his fingers as he hasn't quite mastered it yet. The summer seems the best time as I know we will be eating outdoors lots over the coming months. Archie has a breastfeed before bed and then he usually wakes about 5 for another feed before going back to sleep until 8, and then he has the occasional drink of cows milk in the day. We still haven't cracked sleeping through and I have a feeling that we won't until I stop feeding him, but it isn't too bad most of the time. He still has one nap after lunch and he can fall asleep on his own although he doesn't do it happily. He usually falls asleep in the buggy or sling still. Archie is starting to communicate more and this last month has seen a few extra words creep in. Duck, door, all gone and Edward are now part of his vocabulary. He is showing a real interest in shapes just like his big brother and that same shape sorter that I used to hide by 10am is in constant use, becoming the most played with toy we have ever owned. 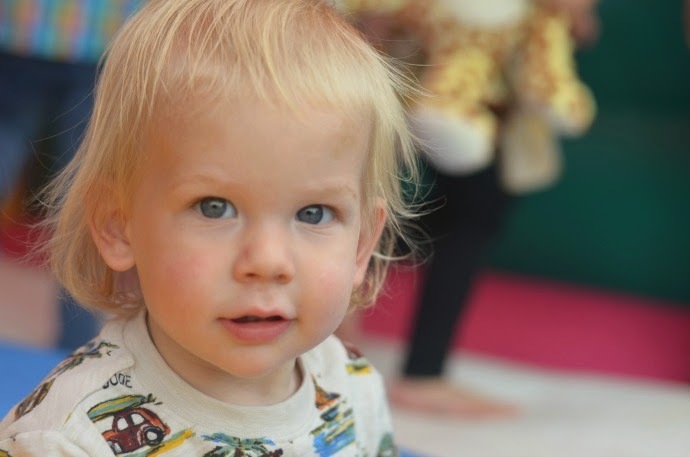 Archie is an extraordinary, affectionate, active and determined 15 month old who brightens our days. I am glad I am not alone in having to fish things out of the toilet, George poured porridge oats in there a short while back, luckily it flushed away easily! 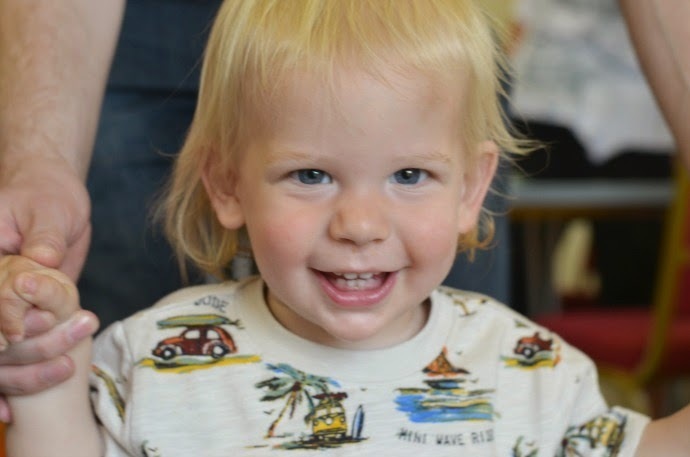 Aww he has a gorgeous smile and I just love that last photo - he's clearly plotting something very clever! How to get into the toilet probably! He is so adorable I know I always say that. But it's true! I bet he is so much fun too! That last photo is great, you can tell he has a cunning plan for something big!!! I wish my kids liked pasta. They are so funny with it, Buba won't even touch it. Most kids love it! Lovely post they really grow up so fast don't they? aww lovely! cuddles are the best!! Ahhh, I remember the toilet phase! Thankfully it only lasted a few weeks. It was a bit of a shock with my girl as her brother didn't have that fascination! He's a beautiful boy. What a cutie! 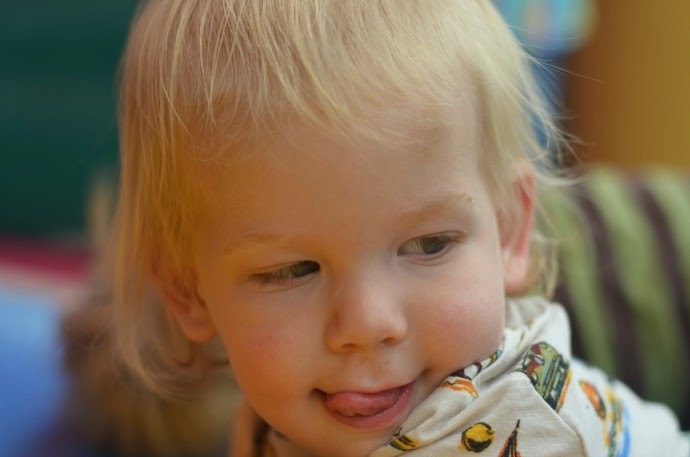 My youngest is nearly 15 months and is equally cheeky and sweet! She only just started sleeping through about six weeks, and we stopped breastfeeding two weeks ago in order to better balance our time as parents between between her and our four year old. Such a lovely stage, but it's flying by!